The length of the fin between the leading edge and trailing edge where the fin joins the board.The base is usually the widest point of the fin outline. The length of the base determines how the board will turn and drive. 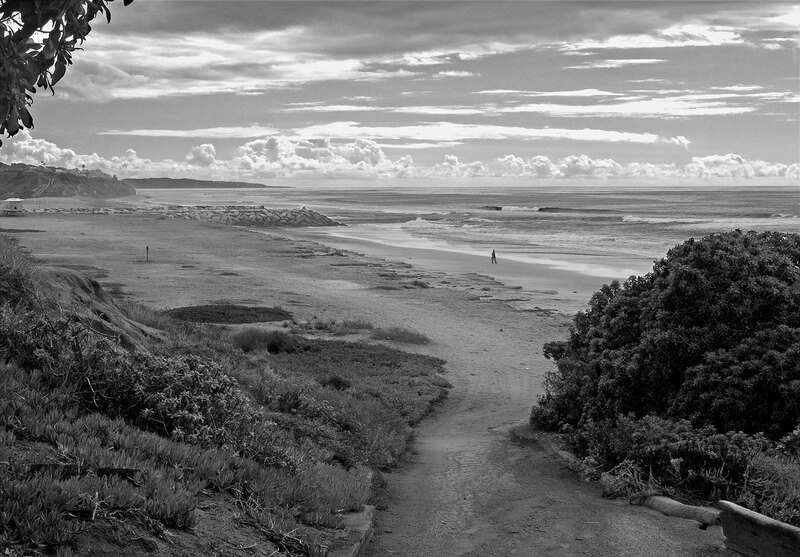 The longer the base the longer and more drawn out the turn will be and the greater the drive. The shorter the base allows for tighter turns but less drive. The distance from the bottom of the board to the top of the fin or how far the fin sticks down into the water. A deeper fin provides more grip, stability, control and drag than a shorter fin. The shorter fin will have a looser feel and will be more likely to slide or slip. 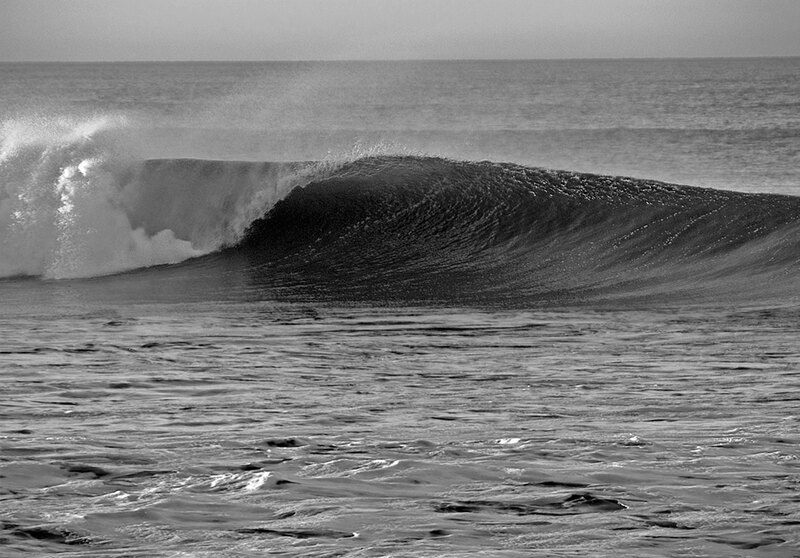 Usually the more area a fin has the better it will hold but the trade off can be a board that feels stiff and not responsive. 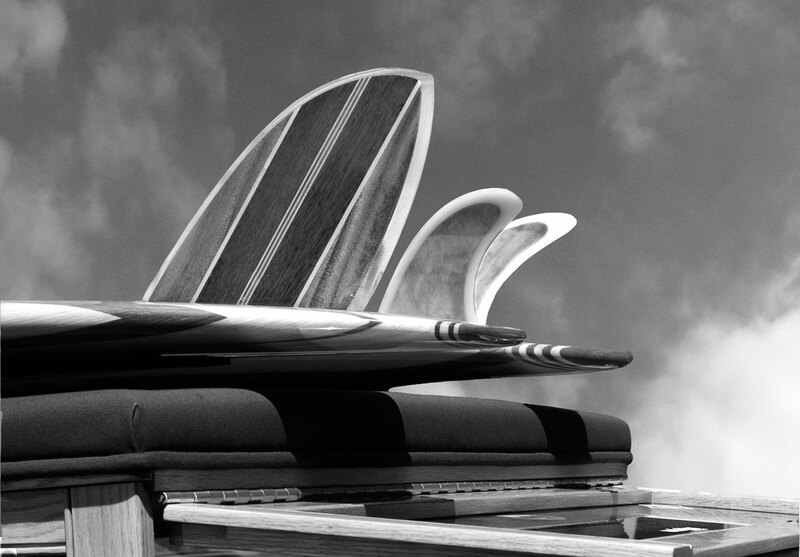 The way the fin area is arranged effects the performance of a particular board shape. More height and a wider base – increased area, more holding power. Less height and a narrower base – decreased area, less hold, more tendency to slide or drift. The angle of the leading edge of the fin in relation to the base. The more the leading edge angles back toward the tail the greater the rake. The more vertical the angle is, or straight up and down, the less rake. 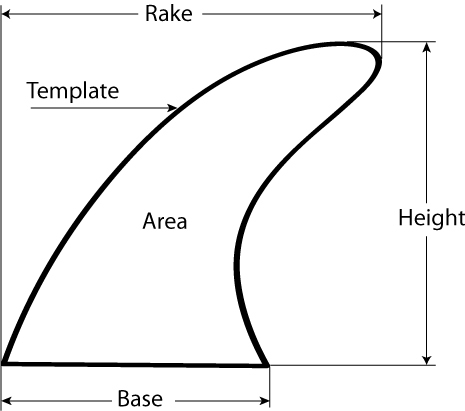 Rake describes the way the fin area is arranged. More rake = longer drawn out turning radius. Less rake = shorter more pivotal turning radius. The outline or shape of the fin. Toe in is the angle of the fin in relation to the stringer. 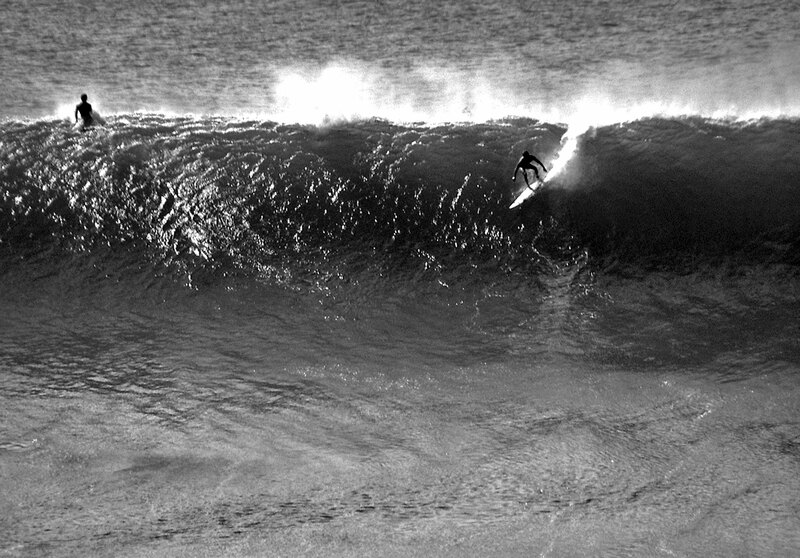 Toeing the front of the fin closer to the stringer makes the board looser and allows for tighter more responsive turns. Excessive toe also creates drag and slows the board down. Decreasing the toe or positioning the fins more parallel to the stringer produces more drawn out and longer turns, minimizes drag and increases speed. 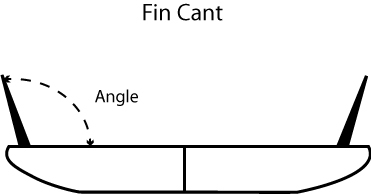 Cant is the angle of the fin in relation to the bottom of the board. A fin that is straight up and down or perpendicular to the bottom of the board has no cant. Canted fins are angled outward toward the rails and will produce a looser feel but with less drive out of the turns. Too much cant produces drag. Less cant promotes more speed especially when going straight. Fins with excessive cant create lift in the tail. The fin box attaches the fin or fins to the board. The boxes are recessed into the foam and then laminated or glassed in. The box allows for adjustment of position and removal of the fins. Flexible fins have a completely different feel than stiff fins. Flexible fins have the ability to store and release energy through the turn. As the turning pressure is released , the fin snaps back into it’s original position, releasing energy and producing forward thrust. The flexible fin responds better to the riders input throughout the turn. 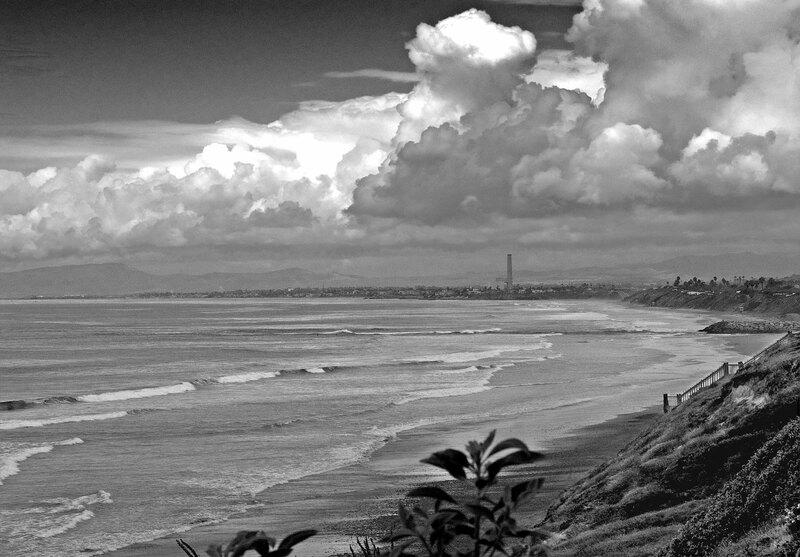 The stiff fin is more difficult to make tight turns but they are more forgiving for a beginning or intermediate surfer. The flexible fin is a little slower to respond at the start of the turn put provides thrust coming out of the turn. The amount of flex that a fin has is determined by the foil and type of material used. If you looked at a cross section of a fin you would see that the thickest part of the fin is in the center and that the front edge is thinner and usually the rear edge is the thinnest. This aerodynamic shape is called the fins foil and refers to the shape of the inside and outside faces of the fin. Different foils affect the flow of water over the surface of the fin and have a great influence on the performance of the fin and the surfboard. There are four basic types of foil. Both sides of the fin are foiled the same and are symmetrical with a continuous curve. The closer the fin is to a true foil the less turbulence there is as the fin slices through the water which allows the fin to pivot easily. A poor foil disrupts the water flow producing turbulence, vibration and sometimes fin hum. Standard foil is usually seen on production fiberglass fins and is a product of the manufacturing process. Flat sheets of fiberglass are laid up to the thickness of the fin box. After the template is cut out the edges of the fin are foiled. This results in a flat central area and not a true foil. Additional layers would need to be built up and then sanded down to create a true foil and still have the fin fit in the fin box. Due to increased time and costs most true foil fins are made of plastic or composite material and cast in molds. 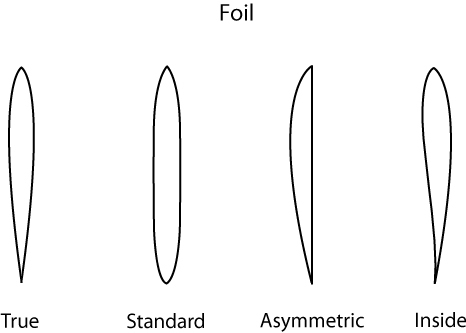 A fin that is only foiled on one side with the opposite side being flat or concave is known as an asymmetrical or flat foil. Most tri-fin side fins, as well as some twin fins and quads are only foiled on the outside edge. 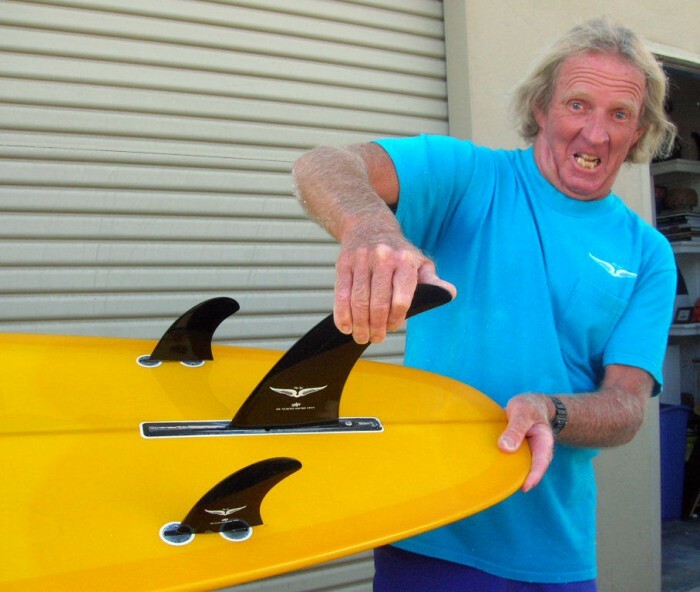 A fin that is foiled on one side produces lift which pulls the fin into the face of the wave. Water travels faster across the curved side of the foil than it does across the flat side. This creates lower pressure on the foiled side than on the flat side and this imbalance of pressure generates lift. An inside foil refers to a fin that has a convex outside face, a rounded leading edge and a concave inside face. The benefit of the inside foil is an increase in efficiency of the water flowing across the fin which generates lift while reducing drag. Cavitation is a disruption of the water flow around the fin caused by water pressure that is not high enough to keep the water in contact with the surface of the fin. Cavitation generally occurs at speed and under great turning load. A hard turn can induce cavitation and cause a fin to break loose, slide or spin out. 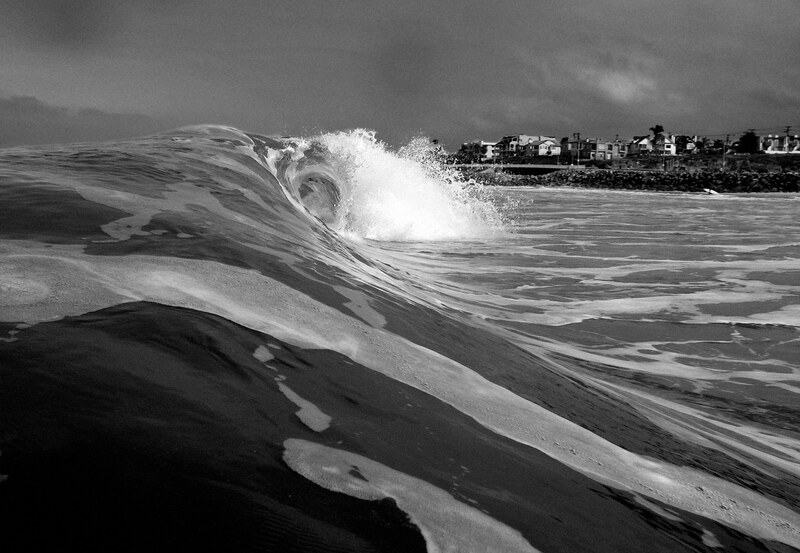 Chop and foam on the wave face can also cause cavitation and a loss of control. Fin boxes allow you to move the fins around and experiment. In smaller waves if you move the fin forward the board will feel looser. 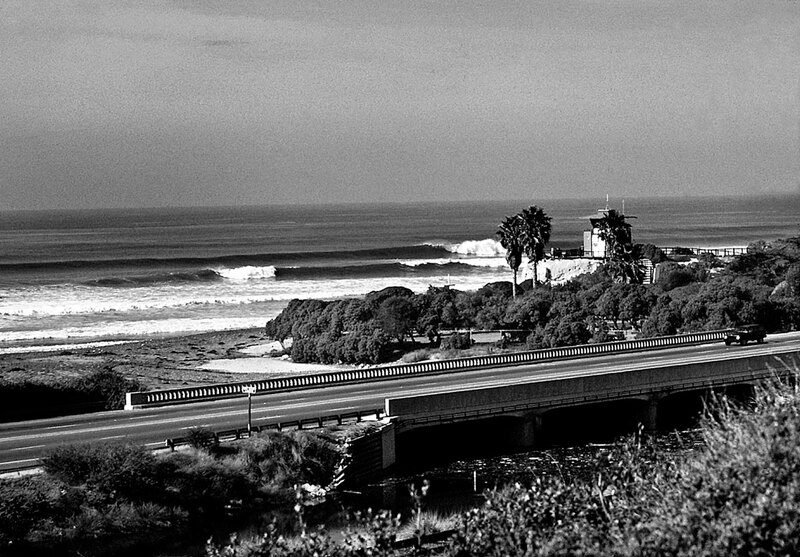 The turns will be more pivotal and sharper. Move the fin too far forward and the board may spin out. Move the fin back closer to the tail for larger surf. The turns will be longer and more drawn out. Fin hum is a vibration caused by turbulence as the water flows over the fin. This turbulence is caused by an improper foil usually near the tip, or a blunt trailing edge. A sharp trailing edge will not hum but can be dangerous. Foil the fin to a sharp trailing edge then dull it slightly to reduce the chance of injury. Drive refers to acceleration and speed while turning. The amount of drive that a fin produces is directly related to the size, surface area, flex, rake and material used to create the fin. 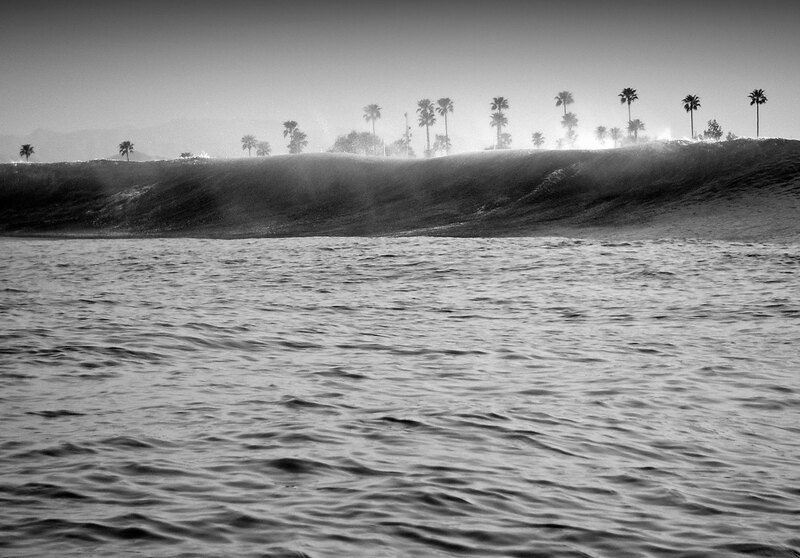 Generally a fin with a longer base and height and a medium flex will offer more drive than a smaller stiff fin. 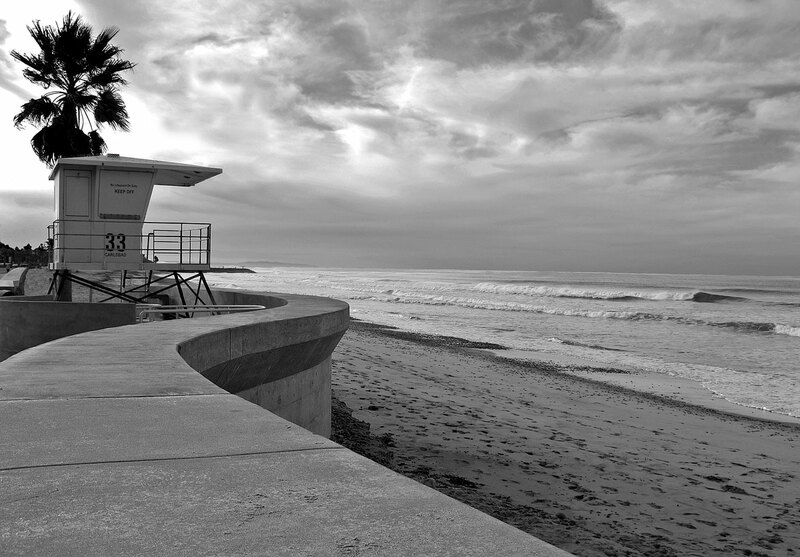 Hold refers to how well the board “sticks” to the face of the wave. 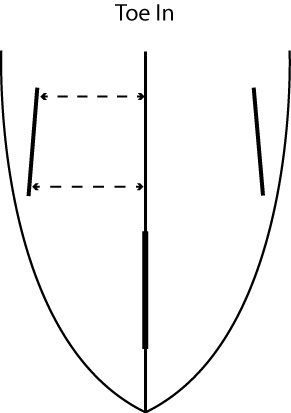 Hold is determined by fin foil, size and template. As water passes over the foil of the fin lift is produced just like air passing over an airplane wing. Depending on how the fin is foiled the lift pushes the fin and the board into the face of the wave resulting in a degree of hold. Smaller fins with less area produce less lift therefore less hold and may have a tendency to slip, release or even spin out. Pivot refers to the length of the turn. The rake or sweep angle of the fin is the main factor that determines the length of the turn. A short fin that is more straight up and down with not much rake or sweep will pivot easily and produce short tight turns. A longer fin with more rake or sweep will produce longer more drawn out turns.